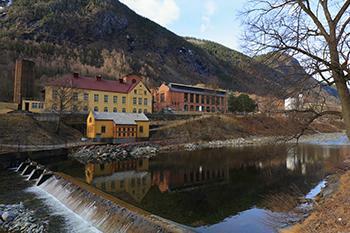 The ‘Rjukan / Notodden Industrial Heritage Site’ covers a former production complex that used revolutionairy hydroelectric power plants in the Måna river and its waterfalls. It was established by the private Norsk-Hydro company in the early 20th century to produce artificial fertilizer. This linear WHS covers a stretch of water and adjacent lands of about 80km length between Rjukan and Notodden in southeastern Norway. 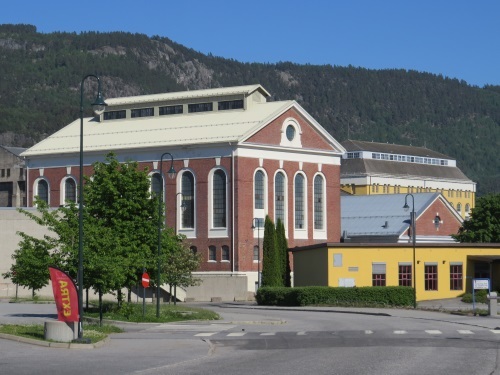 Rjukan/Notodden Industrial Heritage Site was added to the WH List last year. It’s a niche site that very few will have visited before its designation - our visitor count currently still stands on a modest 17. It’s also one of the clearest examples of under-represented cultural properties brought forward by the Filling the Gaps study of ICOMOS (2005): a ‘developing technology’ related to ‘energy conversion and utilization’. At Rjukan/Notodden, hydro energy was created using the natural power of waterfalls and river. Of course I had done my usual preparations: reading the ICOMOS review and the nomination dossier, plus some additional Googling on certain subjects. But I had difficulty to grasp what this WHS exactly involves. What will follow is a reconstruction that hopefully will provide a starting point for future WH travellers. First of all, this is a linear WHS. It covers the flow of the water downhill via two rivers and a lake, plus the railway tracks and the land in between that run parallel to the water. 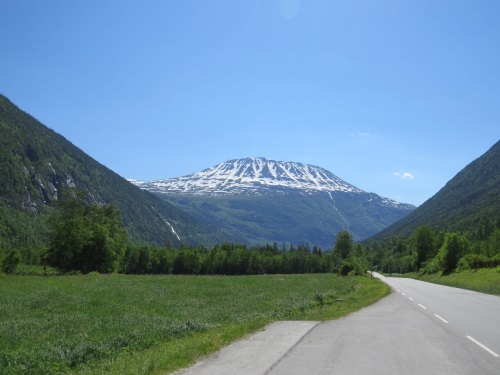 The core zone is 93km in length, and stretches between the towns of Rjukan and Notodden. 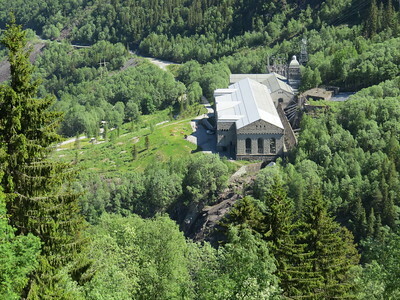 Rjukan lies a little over 3 hours west from Oslo Airport. The E37 road runs parallel to the river and railway. It is an easy and quiet route to drive (there are also buses). While driving I was constantly on the lookout for 'something industrial' - this is an industrial WHS after all. What you get though is the quintessential Norwegian landscape with dark blue lakes and forested mountains. The weather was glorious too on the first Saturday in June, so it was all very pleasant. But the relevance to a technology site eluded me. My first ‘find’ I did near Tinnsjö Lake, almost half-way. Beneath a shelter at a parking lot I stumbled upon a kind of steam rail car on wheels, a Lokomobil from 1903. Across the road stands an information panel about the Lake itself: it was the spot of an act of resistance in World War II when a railway ferry laden with "heavy water" (required for hydrogen bombs) was brought down by the Norwegian resistance. The closer I got to Rjukan, the more dramatic the landscape became. The 1,883m high Gaustatoppen, the highest mountain in the region and still fully-covered in snow, beaconed. The town of Rjukan was built from scratch by hydropower producer Hydro in the early 1900s for its workers. It lies literally in the shadow of this high mountain, from September to March no sunlight reaches the houses. Only in 2013, the residents decided to do something about it: mirrors have been placed on top of the mountain so the sunlight is reflected back into the village. Hydro had chosen this spot because of the Rjukanfossen: a high and steep waterfall, which produced a lot of power. There is a viewpoint just north of Rjukan from where you can see this. Only there’s no water flowing anymore! The course of the river has been diverted because of a modern hydropower station. The original hydroelectric plant now houses the Vemork Workers Museum. It sits high on the hillside, a 20-minute climb from the car park across a narrow riverbridge where people were bungeejumping (again: no water). The museum itself focuses strongly on the WWII-connotations of the site, and less on the hydroelectric story. There is one main hall with shiny black steam engines and pumps: here it resembles the closest comparable WHS, the Ir. D.F. Woudagemaal. Just outside Rjukan I made another quick stop: this time at one of the two railway ferries. These old ships have been lovingly restored to their former state. It's funny to see how the railway track runs right down to the lake’s edge, and then connects with the tracks on the ferry. Meanwhile it was getting late already, so I just drove on the Notodden: a messy little town, with even less of industrial history visible at first sight than elsewhere on the route. So what’s the verdict about this WHS? You’ll have to keep in mind that it is a relict industrial landscape – the same area is also used for modern industries, town life and nature tourism. On paper (such as in the nomination dossier) it is easy to focus on the early 20th century industrial elements, but in reality they hardly stand out. I also believe that the Norwegian cultural or tourism authorities could do more about the interpretation of this WHS to visitors. Except for the Vemork Museum, the remaining elements seem to be kept going by volunteers. There are hardly any signs pointing to wortwhile elements of the industrial landscape. I never found the Tinfos power plants for example, two of the most prominent structures highlighted in the nomination. I had a business trip to Oslo so I decided to make a short side trip to Rjukan and Notodden after my duties. I travelled to Rjukan by bus. The trip took 3,5 hours. I stayed overnight in a small hostel just beside the river and Såheim power plant. It was a sunny spring morning when I started to explore the city of Rjukan. The first thing I noticed already the previous night was nearby Såheim power plant with its robust grey stone exterior and towers. It is impressive especially during night when it is beautifully lit. It was a nice weather so I decided to walk along the river Måna all the way from Rjukan to Vemork power station and Rjukanfossen waterfall. The trip by foot takes about an hour. Along the route there are lots of original factory buildings from the early 20th century. Lately some of them have been converted to offices and workshop spaces. I think Vemork power station is one of the most important single sites in this WHS so I highly recommend to do this long detour. Vemork power station, which was the world's biggest hydroelectric power plant when it was completed, is really imposing building at its location high above the river valley. The Rjukanfossen waterfall must have been very impressive when there was water flowing but nowadays it is a bit sad sight. It is easy to spend a whole day in Rjukan especially if you walk to Vemork and visit Krosso aerial cableway for nice views over the valley and the town. I made only a short stop at Notodden so I don't have that comprehensive impression about it. I found the industrial sites in Notodden less interesting than the ones in Rjukan although the town itself seemed more vibrant than sleepy Rjukan. Old factory area is just beside the bus and railway stations so you cannot miss it. The factory buildings didn’t look inviting and most of them are currently used for some small industry, storage and office purposes. I walked via Tinfos power plants to the workers housing area and then back to the factory area. After a short exploring I headed by train back to Oslo airport. Back to my original question, what makes this complex and geographically large site worth of WHS status. I guess it is mainly the pioneering industrial development related to extensive use of hydroelectric power and the ground-breaking methods to produce artificial fertilizer. The problem is that if you are not an expert on these particular technical methods and substances, the outstanding universal industrial values could seem a bit obscure. Fortunately there are some 'easier' things to understand like the urban communities totally built by this industry for its needs and the innovative transport system between Rjukan and Notodden. In any case, this is a worthwhile inscription if you think it from the 'filling the gaps' perspective that Els mentioned in her review. I think Rjukan – Notodden is comparable to Falun for its qualities and general significance although it is not that well known. As a nature lover I have a bit mixed feelings for this kind of site. Basically it is all about how man has exploited and altered the nature for its needs. I really like Norway’s untouched nature so I had hard time seeing dry Rjukanfossen waterfall, dams that block the rivers, pipelines that direct water to the power stations and so on. But these things have been done a hundred years ago so there is nothing you can do about it. It is always a pleasure to visit Norway as I really like its nature, dramatic landscapes and lovely wooden houses. Although especially Rjukan is an interesting little town, the outstanding universal value for just the industrial places is a bit hard to notice without acquiring some background information. But of course there are certain factors that make this site special in the industrial category. I think they should brand this site better and make it clear for visitors why these places are important enough for earning WHS status. All in all, I had nice time visiting the site but it being a WHS is not that self-evident for me. I visited this site in August 2012. I took a train from Nordagutsu through Hjuksebö to Notodden. 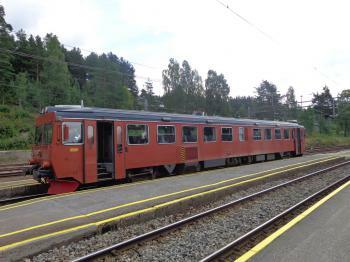 The railway between Hjuksebö and Notodden is supposed to be part of the World Heritage Site and is apparently still in use. I happened to take this photo of the train on the railway because I thought it was cute. The site lies in the southeast of Norway, its furthest point is some 200 km away from Oslo. 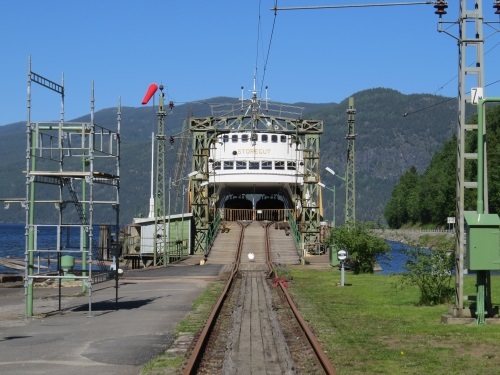 The towns of Rjukan and Notodden are fairly accessible by car and bihourly public bus.